Wow, it’s pretty crazy. We’ve been writing product updates for a full year now. How time flies when you’re having fun. Our aim with these product updates is to keep you up to date on the happenings with Zero BS CRM, what we’ve been adding and how we’re improving the product every day. If you’ve not yet purchased any of our extensions, then our Entrepreneur’s Bundle is our most popular choice. We’ve been hard at work migrating the contacts to a new database structure. This moves them out of a custom post type and into their own database table. This migrated a LOT of objects to the new structure and months of development work building the data into a much more flexible solution. This was released in version 2.70 and lays the foundations for a lot of cool things to come. Our Sync tools (PayPal Sync, Woo Sync and others) have been storing transactions slightly differently than you’d expect. If you had a checkout cart with 10 items, then ZBS CRM would add them as 10 separate transactions. This over-stated the number of transactions and also meant each one was logged with an ID like ‘woo-transaction-0, woo-transaction-1’. This also meant that additional operations on those orders (such as refund a WooCommerce transaction) would not be possible with the data setup the way it was. So we’ve improved this. Transactions are logged only once and any items are stored against the transaction itself. It makes it easier all around. You can’t edit the line items, but it paves the way for improved transaction reporting (and accurate transaction counts from now on). If you want to see the history for a single contact, no problem. Just hop on over to the “Send Email” page and you’ll be shown their email history. If there’s certain emails you want to stop from going out, you can turn them to Inactive and they won’t be sent anymore from the CRM (be careful when using that feature though). You may want all your CRM users to have Client Portal access but not send them an email about it. Simply disable the template and they won’t get sent. We’ve also added the ability to Preview any of the templates, as well as send a test email (this sends to the site admin – so again make sure that’s you!). This will show you the email as it looks to the recipient (although the links will be blank and placeholders) replaced by the real thing when the emails go out. Another biggie here. We’ve been using customer files ourselves and hit this problem a few times. A file is uploaded with a title like ‘myfile.pdf’ and we cannot remember what this file is (without clicking into it and loading it). This gets hard to manage when there’s multiple files for a customer and knowing which is which. So, we’ve improved this and added the ability to name the files and give them a description. For you people hankering for our coming soon “Client Portal Pro” we’ve also added a choice for whether to show the file in a contacts client portal for them to download (or not). We’ve also added a “Company View” page which gives you extra information and a nice design for your companies (if you’re using B2B mode). It’s a perfect option if you’re managing companies, and want to be able to see who works at that company, and yes, you can add custom tabs here too. 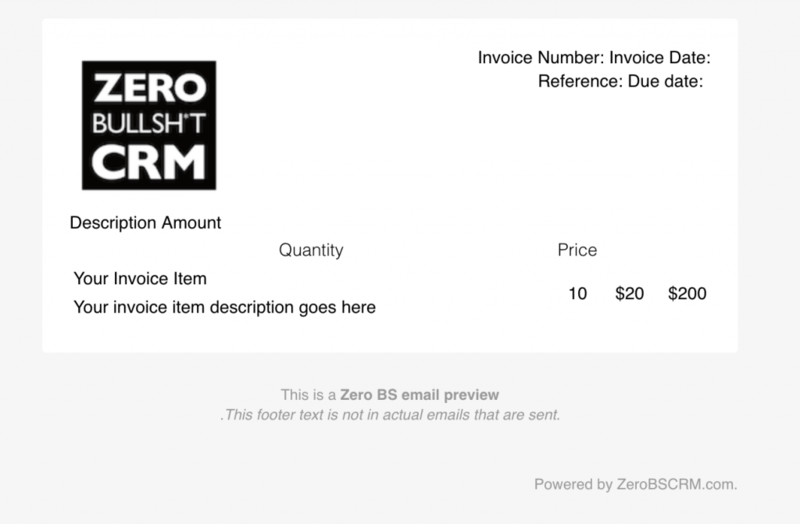 We’ve also started to document some example code snippets for extending Zero BS CRM. There’s lots that you can do here (or a developer, if you aren’t technical). You can check out the examples here. We’ve started a commitment to provide you with Live product demos where you can join and see ZBS CRM in action (including our extensions). This is a guided tour where you can ask us questions and learn more about our CRM. The change Log for April is pretty jam packed. Rather than continue to paste them in here (some of the points are technical), we are making a new area that’ll display these in a simple, clear no BS way for those who are interested.